The much awaited list of nominees being considered for the first International Skateboard Film Festival Award of Los Angeles has been released. Mike Manzoori's, Pontus Alv and French Fred are in competition for the Best Director Award. French Fred was nominated for his work on the Javier Meddizabal Cliché Commercial, which was also nominated for Best Short or Web Video. Pontus Alv received his for In Search of the Miraculous, which is also up for Best Documentary. The film is an introspective piece that gives viewers at look at the skater's childhood including an intimate look at his relationship with his father. It is going up against Chris Nieratko's documentary about a transsexual skateboarder, Phil Evan's film about six European skate photographers and Steve Olpin's Freedom of Space. 5boro's Steve Rodriguez along with his cohorts Tombo Colabraro and Mark Nardelli were also nominated for the Best Commercial Award as was Torey Pudwill's Big Bang. The other awards up for grabs are Best Brand Movie, Best Independent and Emerging and Best Skate Shop Video. Etnies' Mike Manzoori is being considered for the Best Commercial Award as well as the Best Director for his role with Rain or Shine. Rain or Shine features skater Kyle Leeper and is still available for viewing on the etnies website. The popular films Stay Gold and Not Another Transworld Video received a nod for Best Brand Movie and the Furnace Skate Shop made the list for Best Skate Shop Video. For those that are interested, a complete list of nominees is available online. 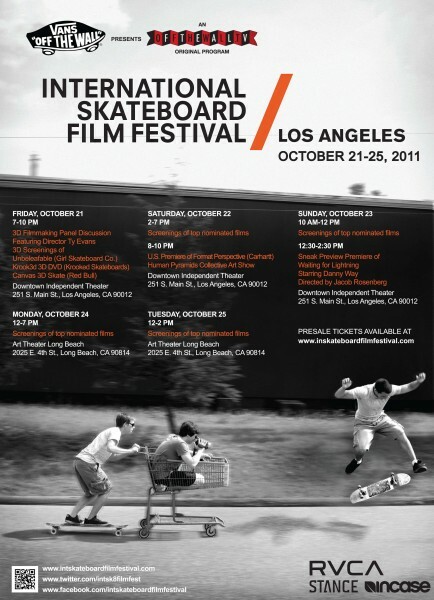 Skate fans will also be able to catch screenings of the nominated films in Los Angeles and Long Beach, California, from October 21st through October 25th, 2011. Everything kicks off tomorrow night at the Downtown Independent with a Ty Evans 3-D panel discussion followed by 3-D screenings.